Authorities across the country were forced into action after last month’s Domededovo attack exposed flaws in security screening. 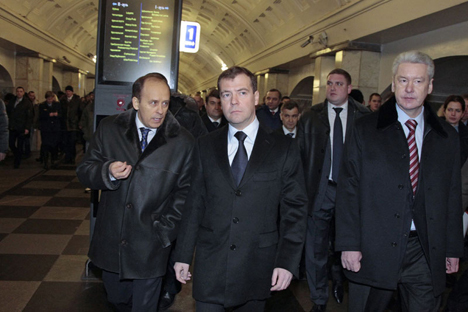 With Russia still reeling after the Domodedovo airport suicide bombing on Jan. 24 that killed 36, President Dmitry Medvedev made snap inspections of public transport hubs, putting his authority behind attempts to improve security. Most recently, the president arrived unannounced at Moscow’s Vnukovo airport, where he passed through a metal detector and had his pockets searched by a security service officer. Before that, he surprised staff at a metro station and Moscow's Kiev railway station, a key link with the restive south of Russia, which has been the source of most home-grown terrorism in the past decade. “Just take a look, I haven’t seen a single police officer,” the dissatisfied head of state told embarrassed officials at Kievsky station. While skeptics may see the visits as primarily a photo opportunity, the reality is that in Russia, it often takes intervention from the highest level to get things moving. For example, in response to the president’s suggestion that more police dogs should be used to enhance security, Moscow Mayor Sergei Sobyanin, ordered the construction of kennels for 500 dogs that will be trained for security duties. Under the threat of dismissal, security heads across the country are now busily reconsidering how and where their manpower is deployed. And lawmakers were rushing to tighten controls in the production of fireworks, which, with chemical alterations, can yield weapons-grade explosives. Coinciding with moves to reform the police, the Domodedovo bombing highlighted many security failures, from lack of a defined chain of responsibility among law-enforcement bodies to an absence of patrolling officers at key locations. “At the moment everyone is blaming everyone else, saying, ‘I’m only responsible up to such and such an extent,’ or there is supposedly joint control which in reality results in there being no control at all,” Sergei Ivanov, the D eputy Prime Minister, told security and transport chiefs four days after the bombing. Chechen warlord Doku Umarov claimed responsibility for the attack, which was carried out by a 20-year-old man from the republic of Ingushetia. Rashid Nurgaliyev, the Interior Minister, has said more security staff will be placed at airport entrances and in open terminal spaces. Technical security systems are also being rapidly installed at railway and bus stations. Since the January attack, authorities have added almost 130 metal detector frames at railway stations in Moscow and St. Petersburg. All stations will be equipped with detectors by late March, according to statements by Russian Railways. There are also proposals to link some public transport junctions with the Glonass satellite navigation system to monitor transport links from the North Causasus to Moscow. But not everyone is impressed. “The current developments in state security seem like just another public relations campaign. I fear that once it’s over, things will go right back to where they were,” said Vladimir Yevseyev, Director of the Center for Public Policy Research and an expert on international security issues. “Countries with serious security problems do not solve them using metal detectors,” he added. The president was quick to blame lax security for the airport bombing. But authorities acknowledge there is a wider failure to tackle Islamist militancy in the North Caucasus. Terrorist groups have carried out several attacks in Moscow over the past decade, including twin suicide blasts on the Metro that killed 40 last year. Ivanov said that a general rethink of security principles was required. The government last summer began implementing a new $1.8 billion, four-year program for “ensuring security of the population on public transport” and had already disbursed almost $267 million when disaster struck, according to Ivanov. “It’s no small sum, but as far as results are concerned, we’ve just seen,” he said of the bombing. The United States set up the Department of Homeland Security after the attacks of Sept. 11, 2001, and Ivanov called for a similar organization to oversee the security of transport and other infrastructure. Current reform of the police, with an expected cut in the 1.4 million-strong force by 250,000 officers, may complicate the effort. But the interior ministry has said it will move to better co-ordinate law enforcement with private security companies that employ 640,000 people and in many cases already work in tandem with the police. In recent security discussions, everyone from the president down has emphasized the need for greater public vigilance. Medvedev has also ordered security and transport officials to draft by April a schedule for regular exercises on how to protect people in public places from terrorist attacks. Judging from the public reaction to the airport attack, citizens might welcome the initiative. In a national survey in early February by the VTsIOM polling organization, 80 percent of 1,600 respondents feared that they or their relatives may fall victim to a suicide bombing. A third said it was impossible to eradicate terrorism in Russia. “There is a lot left to do,” said Oleg Orlov, director of the Memorial Human Rights Center. According to him, the solution to the terrorism problem can only be found at its source – in the North Caucasus region. “Solving social problems, fulfilling society’s expectations, that’s the solution,” he said.